Home / Finance / Which Are the Best Money Lenders Near Me (Personal, Auto and Business Loans)? Which Are the Best Money Lenders Near Me (Personal, Auto and Business Loans)? If you’re looking for money lenders near you, the most convenient option is online money lenders. Whatever state or city you live in, you can borrow money online instantly. However, the question, “Which are the BEST online money lenders near me?” requires deeper analysis. The best online money lender depends on your specific needs. This guide will help you identify the best lender for business, auto, and personal loans. Considering that personal loans are the fastest growing type of consumer debt, getting a personal loan is virtually a guarantee. Therefore, getting the best personal loan is more about avoiding the pitfalls than searching for a lender. Here are the things to watch out for. Various upfront fees associated with personal loans, include: application, brokerage, closing, commitment, document preparation, processing, paper copy, underwriting, credit insurance, and origination fees. Most of these fees can be avoided by getting your personal loan from a direct lender. Why do prepayment penalties even exist? Well, the reality is lenders don’t only make money from the interest they charge on your loan. They also make money by placing your loan in a security and selling it. Hence, the institutions buying that security expect a certain yield from it, based on the assurance that your loan will remain outstanding for the set time period. Lenders whose loans include such penalties always clearly state this to applicants, so you can avoid them if you don’t want them. You should never leave money on the table when it’s offered to you. Therefore, always check whether your loan is tax-deductible. For instance, as much as $2,500 per year can be deducted from the interest you pay on your student loan. Using the IRS’ tax assistant tool, you can gauge exactly how much you can deduct on your student loan interest. Lacking employment is hardly an issue when getting loans, as long as you have another source of income. All the lender wants to know is if you can repay the loan. However, the issue on how to get a loan with no income or cash loans without proof of income is a different matter. Since you have no source of income to repay the loan, you can opt to borrow against your home or get a car title loan. Alternatively, you can go for a loan with co-signers who have a good credit score and reliable income. Start your search for the lowest interest rate personal loan right here. Every year, more and more loans are going to businesses all over the United States. However, you need a systematic approach to get the best money lenders for small business. Start by assessing the major aspects before you consider the less important ones; otherwise, you might be influenced by personal preferences, instead of a rational decision. The only lenders you can consider are those offering loans within your geographical location. Fortunately, most online money lenders are present in all or most US states, as you can see from these 7 top small business financiers. In this step, you can also check for lenders who serve your industry (some don’t serve specific industries like accounting and non-profits). Having identified which lenders you can approach, narrow down to those capable of giving the amount of money you need. If you have a big financial need, you’ll have to focus on the few online lenders with that capacity, as seen from these top 7 lenders. Also, take note of the type of loans you can get, based on your needs. For instance, you may need specific equipment financing or a line of credit, instead of a loan. You can now consider the loan Annual Percentage Rate (APR), which gives you a clear indicator of how costly the loan is. APR takes into consideration the loan interest rate, as well as other related fees, like loan origination fees. It varies from lender to lender. Here are 7 top online money lenders and their APRs. The APR also depends on the type of loan, as well as the requirements for such loans. Such loans as the SBA loan and secured loans offer much better APR, compared to unsecured loans or high-risk small business loans. Also, you’ll get favorable interest rates, if a high credit score is required. Don’t forget to evaluate any penalties you may be charged for prepayment or late payment. After figuring out how much the loan will cost, the loan term will show you how well you can manage the repayments. This is an important consideration if you have cash flow issues, which can affect your monthly loan payments. Hence, carefully evaluate this aspect, since different lenders have varied loan terms. Here are 7 top online money lenders’ loan terms. Finally, you can evaluate other aspects as the turnaround time (how fast you get a response after your loan application). Fast loans can be incredibly convenient, but speed shouldn’t override other more important considerations. Start your business loan search right here. 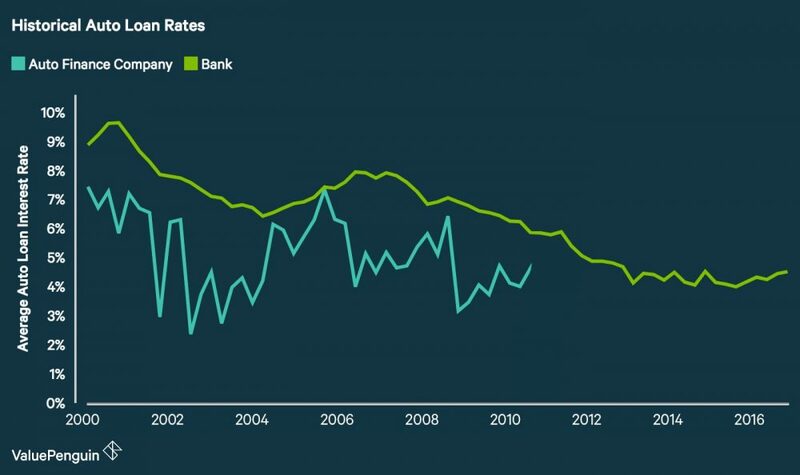 Currently, interest rates for auto loans are at the lowest, based on historical figures since 2000. This presents a great opportunity to get the cheapest possible auto loan. But, remember that getting an auto loan is radically different from loans to secure other types of assets, such as a real estate loan. The best auto loan option comes from a direct lender rather than through a car dealership. This way, you’ll avoid payment packing. With “payment packing” the dealership adds extras to your monthly loan payment. Such extras may be unnecessary, like extended warranties and GAP (Guaranteed Auto Protection) insurance. However small the added monthly amount may seem, it will add up to huge sums during your loan term. If you’re worried that a low credit score will disqualify you from getting an auto loan, the data shows a different story. 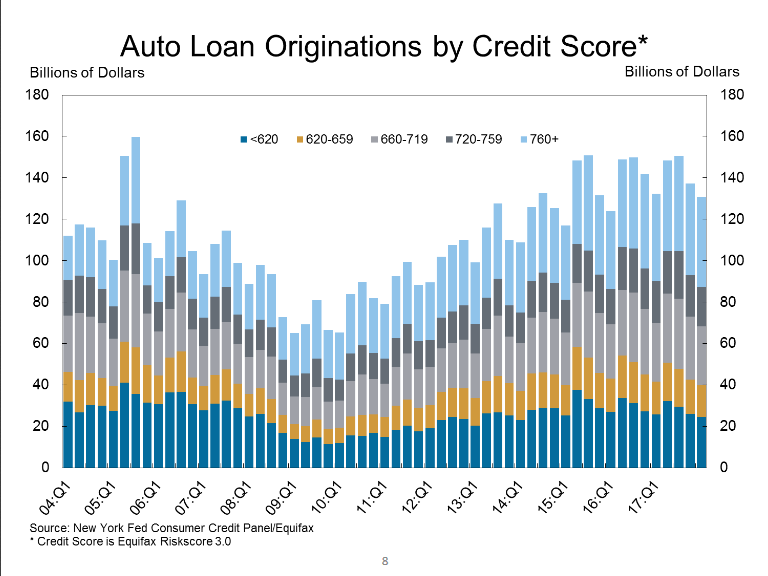 As you can see from this quarterly report by the Federal Reserve Bank of New York, loans are generally equally dispersed across low and high credit scores. If you have a low credit score, you can easily access loans from money lenders for bad credit. However, the only thing that you should worry about is the interest rate. Your auto loan interest rate will greatly vary based on your credit score. Unlike real estate loans, where the asset typically appreciates in value, the asset acquired by an auto loan depreciates in value. Down payment: With a down payment, you’ll borrow less money. In case anything happens to your car, the insurance payment will likely cover the full loan. Short term loan: Although short term loans have higher interest rates than long term loans, the total cost will be lower. Start your auto loan search right here. As complicated as it may seem, identifying the best money lenders and applying for your loan is the easy part. The hard part is repaying your loan. Being consistent in loan payments for months or years requires careful planning and dedication to avoid delinquency.